Let's admit it, not everyone is a cauliflower fan. But i am sure that this recipe would actually make you to start liking it. This dish is a good accompaniment with chapatis, rice, rasam, curd, moor & sambar as well. Kids would love this dish too since it is lively with bright color. 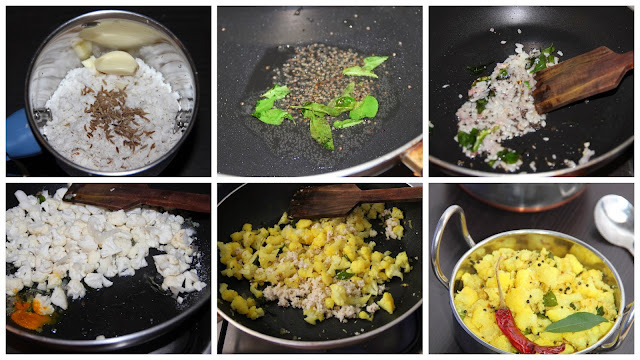 In a pan add oil; add mustard seeds when it splutters then add curry leaves. Add chopped onion and cook till it becomes soft. Then add green chillies and cook for a minute and add the chopped cauliflower, turmeric and salt. Sprinkle little water and cover the pan and allow to half cook. Now open the lid and add coconut mixture. Mix well and cook till the garlic smell goes away from the masala.